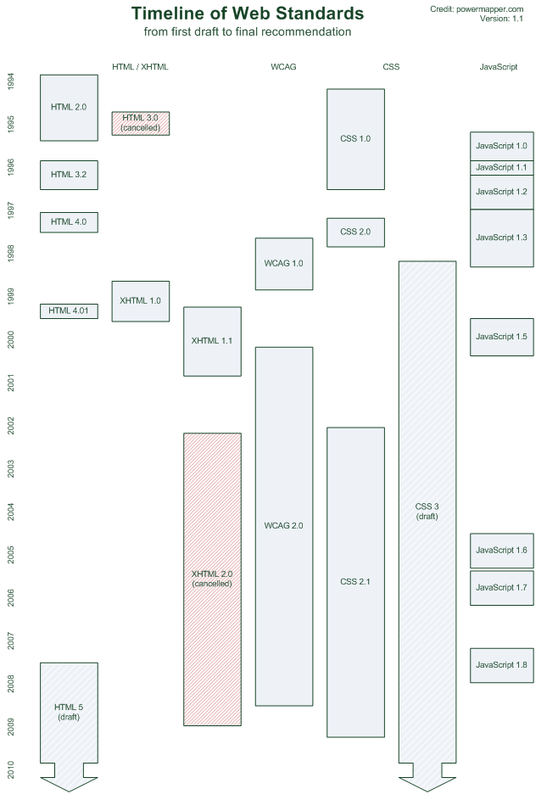 This diagram shows how web standards have developed since 1994. Originally HTML and related standards were discussed and agreed by a small group of interested parties on a mailing list. Later the W3 was formed, and it put in place increasingly rigorous processes, with increasing amounts of public consultation. While solid process and consultation is a good thing, one striking point is how long it now takes to get W3 standards from Draft to Recommendation status. It took 8 years in the case of WCAG 2.0. It's taken 11 years, and counting, for CSS3 (the oldest CSS3 working drafts are dated 1999). The editor of HTML 5 recently forecast a completion date of 2022 for HTML5.